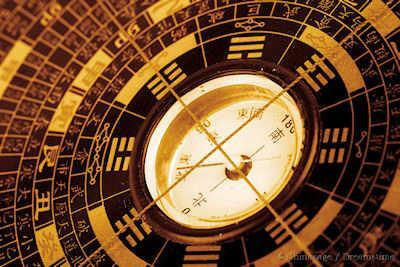 Feng Shui is a Chinese tradition going back thousands of years. It is closely associated with the Daoist tradition as it is concerned with living in harmony with nature. It comprises several concepts: yin and yang (see separate section); qi and the five elements. Feng Shui consultants are still used in China and around the world to advise on correct positioning and alignment of new buildings as well as layout of houses and gardens. Traditionally it has its highest importance for determining the most auspicious site for burials; this was because the spirits of the dead are considered particularly sensitive to placement. 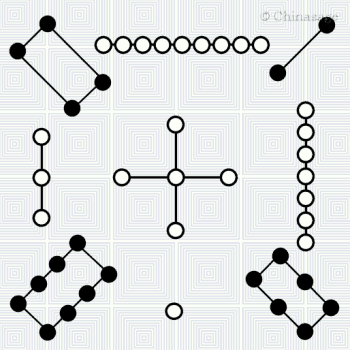 In determining directions the intricate and complex 罗盘 luó pǎn compass ➚ is used. The landscape was considered to be full of hidden good and bad flows of 'qi' and the compass together with the geomancer's skill would be able to determine the most auspicious locations. As Feng Shui is literally translated as ‘wind 风 fēng and water 水 shuǐ’ its elemental origins are evident. The principle is sound enough; position everything for maximum harmony. A house should be oriented to catch the sun and avoid cold winds. However, in its more ludicrous pronouncements, it advocates such things as the importance of keeping a toilet seat down so fortune is not flushed away. It is the mixture of common sense and the absurd that has made Feng Shui a source of ridicule in the recent past. The wish to categorise things can be seen as a sensible way to try to make sense of the world. The five essential properties (fire; water; wood; metal and earth) 五行 wǔ xíng, should not be thought of in the same way as Chemical elements, they are more like the set of elementary phases of matter, so anything liquid is showing its inherent 'water' property and anything gaseous 'fire'. From these phases the destruction cycle naturally arises: water can destroy fire; earth dams and adsorbs water; wood is nourished by earth; metal cuts wood; and to complete the cycle fire melts metal. Ingeniously there is a generation cycle that is not simply the reverse: water irrigates wood; wood fuels fire; fire creates ash (earth); earth contains metal (ores) and metal attracts water (as in dew). Each elemental essence also has a fairly sensible color associated with it (e.g. green for wood) and has an associated compass point (e.g. fire with south as this is where the fiery sun is located). Similarly each season and year has an element, so you can see how a whole system can be built up around the basic properties of matter. Any substance can be considered a mixture of these elemental properties. The five elements were so important that they entered local traditions. Each element had a 'ruler' as a deity and on occasions a large procession with effigies of the 'five rulers' would parade around towns and cities. This theory goes back at least 2,000 years to the Han dynasty, Emperor Wudi amongst others held great belief in the system; for example he timed the most propitious day to launch military campaigns based on Feng Shui. Each dynasty had an element associated with it, and the current 'element' determined the color of court uniforms and even the key note of court music. The sequence of elements associated with dynasties followed the destruction cycle so that the Zhou dynasty (fire) was naturally succeeded by the Qin dynasty (water). This is why an understanding of Feng Shui is needed to understand the details of Chinese history. For example the reason the Yellow Turban rebels in the Han dynasty chose yellow was that the destruction cycle of elements meant yellow should be able to conquer the ruling Han dynastic color of red. In the Forbidden City all the roofs are yellow except for the library which has a black roof because black is the color for water and so should help to protect the books. Imperial officials used to change the color of their clothes on the change of season to match the cycle of elements, its influence was all pervasive. Another example concerns the association of autumn with death, and so executions only took place in autumn. The shape of the forms of the landscape are important in Feng Shui. If the form of a dragon is identified it is very bad practice to construct anything that appears to cut off a limb of the dragon. In the late Qing dynasty when Europeans began to settle and build factories and railways; the rules of Feng Shui proved an obstacle to development. The construction of anything linear such as railway lines is considered dangerous Feng Shui as the Qi follows the line with too destructive a force. Coal mines were also seen as damaging in Feng Shui terms as well as disturbing the Earth dragons, in 1882 coal mining was suspended in Hebei after widespread local protests. Imperial pronouncements were insufficient to dislodge age-old faith in the correct siting for new buildings; route of buildings and laying of telegraph cables. Even today objections to building developments are often couched in terms of disturbance to Feng Shui resulting in suitable monetary compensation. Taiwan is where Feng Shui still has a strong influence, it was even a big issue in the 2004 Presidential election. A consultant advises on all sorts of things such as why an excess of road traffic accidents take place. It also has remained strong in Hong Kong where the advice of a practitioner will be sought on all construction projects. In Mainland China the effect of the suppression during the period 1949 to 1990 is still felt, there is far less importance given to Feng Shui concerns. In recent years it has seen a revival and anyone rich enough may seek a practitioner's advice for house and grave placement. Life then is a matter of taking account of these essential properties to live in harmony with the world. The placement of a house in the landscape will ideally be facing south in front of a bend in a river with a hill behind it. The Forbidden City is the supreme example of this. The location chosen lacked a 'hill' to the north, so this was built artificially and stands as Jingshan 'Coal' hill to this day. The 'Golden River Stream' was channeled to run in a loop south of the main complex of buildings. The ideal sunny location for a house coincides with most people's idea of a nice place to live it is not surprising that Feng Shui has many followers including Donald Trump (recently the cricketer Geoff Boycott ➚ revealed himself to be a believer). Practitioners take into account the wider context of the environment, a holistic approach, not objects studied in isolation. Some years ago Feng Shui became a fad in both America and Europe. For a Western audience the ancient system lost the spiritual side (demons, graves) and concentrated on the more materialistic claims (good fortune, health). There are two main schools of Feng Shui: the ‘Forms Shool’ that puts the position in landscape as the key factor and the ‘Orientation School’ that use an accurate compass on its own to determine properties of places. Modern schools also include the Bagua school that uses the eight Yi Jing trigrams as the main inspiration; the Flying Star school that takes the stars surrounding the Great Bear constellation as their starting point and the Black Hat sect founded by Lin Yun ➚ in the US. Feng Shui practitioners are particularly concerned to produce a smooth and curved motion of Qi; any sharp, straight tower or path or road can generate a poisonous arrow ➚ of too vigorous a flow of Qi. Obstacles that block the flow of Qi should also be avoided. Practitioners can then advise on how to mitigate the effects, often by diverting the direct flow ; plants; wind chimes and mirrors can be used to calm the flow. Very early in Chinese history philosophers studied the properties of numbers. The yin-yang system, five elements, Taiji and Yi Jing are all connected by the curious properties of numbers. the tradition linking them together are the Luo Shu and He Tu figures. These are attributed to the legendary Yu the Great from about 4,000 years ago. Inscriptions from Yangshao culture push back the history to at least 5,000 years ago. 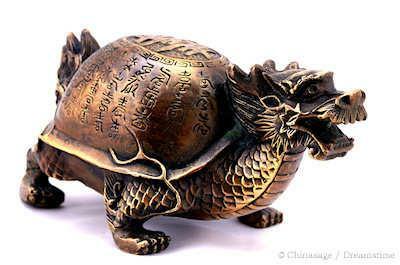 The book/inscriptions of the River Lo (or Lu or Luo) 洛书 luò shū describe the design on the back of a tortoise or turtle. The Luo is a major tributary of the Yellow River that joins it downstream of Chang'an (Xi'an) where it makes a dramatic turn to the east. The turtle had the pattern of the 3x3 magic square inscribed on its shell. The map has nine sections or 'rooms' 九宫 jiǔ gōng. Each room also corresponds to a planet. Other legends have the eight trigrams and first written characters appearing in the same manner. The Yellow River map (河图 hé tú) is a mystical map which sprang out of the Yellow River after a flood either as revealed land or on the back of a turtle. Another legend has the legendary Emperor Fuxi emerging from the Yellow River with the figure on the back of the dragon-horse 龙马 lóng mǎ he was riding. The Yellow River area was the cradle of early Chinese civilization. The story is mentioned in the Great Commentary to the Yi Jing. The traditions are hard to disentangle after two thousand years. Turtles / tortoises have played in an important part in ancient myths and symbolism. They are very long lived and their bodies represent the flat Earth and the shell the vaulted Heavens above. 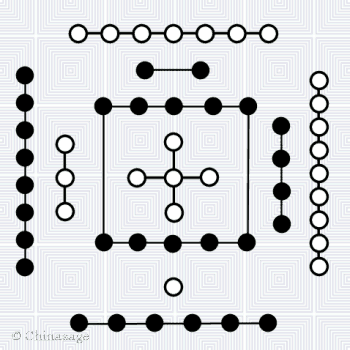 The Luo Shu figure is considered a representation of the 3x3 magic square. The arrangement of the numbers 1-9 is such that all the rows, columns and diagonals add up to the same number 15 making it a ‘magic square’. Fifteen is a significant number, multiplying 15 by 24 - the number of mountain directions gives 360 a number with ancient cultural significance as the (rough) number of days in the year. The year is thus split into 15 day periods (half a month). The magic square became very important when taken up by Arabs a thousand years later and contributed greatly to the study of numbers. Here is its original representation as counts of circles, open dots are yang (odd) and closed ones yin (even). The Luo Shu Magic Square. From 朱熹 Zhū Xī's (1130 - 1200) 周易本义 zhōu yì běn yì Commentary on the Yi Jing. The Chinese were very fond of counting in tens, long before decimalization came along, there were even ten days in a week, ten hours in a day for a long time. So the numbers 1-9 form a fundamental counting. For many purposes numbers greater than 10 can be associated with a number 1-9 using a simple procedure, add up the digits of the number and repeat until it is a single digit, for example 1476 is 1+4+7+6=18 then 18 is 1+8=9 so 9 is the 'fundamental' number for 1476. Five is associated with Earth (soil) and is the appropriate central number; five is after all the average of the numbers 1-9. Of all the numbers it has the most associations. The magic square also has even/odd alternation of numbers around the edge. Even numbers are yin and odd numbers yang so the square represents continuous yin-yang transformation. In this figure all four opposite pairs add up to 10 (4+6=10, 2+8=10, 9+1=10, 3+7=10). If you look through how the numbers 1-9 are arranged it gives a zig-zag path around the square. This ordering gives the rationale for the Flying Star Feng Shui system. In this system the magic square is used to analyze a space into eight directions; the ordering of the Lo Shu numbers shifts every twenty years according along the original zig-zag path (1 takes the place of 2, 2 in place of 3 etc.) and so date and time can be introduced into Feng Shui analysis. The Flying Star school takes its name from the stars of the Big Dipper (Ursa Major) where nine stars are identified. The calculated arrangement is used for assessing good and bad luck of the layout of buildings and general orientation of things. The numbers have other associations: (1, 6) ancestors 宗 zōng; (2, 7) the way 道 dào, (3 , 8) friends 朋 péng; (4, 9) understanding 友 yǒu and (5, 10) guardianship 守 shǒu. If the layout of numbers is related to the body then the following anatomical associations can be seen: 9: head (highest number), 1 feet (lowest number), 3 left, 7 right, (2, 4): shoulders, (6, 8) : legs and 5 : torso, center. A traditional 罗盘 luó pǎn (lopan) compass used in Feng Shui often has one ring representing the eight surrounding numbers (so omitting 5) with opposite numbers (usually represented as joined up dots like constellations instead of a numeric character) adding up to 10 (5+5). A related but more complex figure is the He Tu figure. Instead of a square the numbers 1-9 are arranged in a cross-shape. At first glance there seems little resemblance to the Luo Shu figure except that five is in the middle. However if you look at the pairs of numbers around the center they are all also adjacent in the magic square : (7, 2); (3, 8); (4, 9) and (1, 6). Moreover all these pairs contain both odd and even (yin-yang) numbers. The arrangement also reveals that each of the numbers in the outer square is five more than its neighbor in the inner square (2+5=7; 4+5=9, 3+5=8 and 1+5=6). Here is its original representation as counts of circles, open dots are yang (odd) and closed ones yin (even). 5 is repeated above and below the center to give 10. The Yellow River Map (He Tu) figure. The taiji has eight symbols (also known as the 阴阳鱼图 yīn yáng yú tú yin-yang fish diagram) arranged in a circle around the symbol for yin-yang swirling around each other. The figure can be transformed into a square with each of the eight trigrams taking up one space. The arrangement is considered to be the invention of King Wen of Zhou ➚ who also devised the order of hexagrams in the Yi Jing. Using this arrangement the magic square numbers can be associated with the bagua trigrams. The choice of which trigram around the taiji is not random but tied to the Luo Shu figure and the properties of numbers. Just to complicate matters there are two arrangements of the trigrams to consider not just one. The origin of the Earlier (or Former) Heaven arrangement (先天 xiān tiān) is somewhat confused (it is over 5,000 years old after all) it is usually attributed to Emperor Fuxi. The trigrams are arranged so that their inverse faces them across the center with yin changed to yang and vice versa. So Earth kūn ☷ is opposite to Heaven qián ☰ and gèn ☶ is opposite to duì ☱ (the tops of the trigrams are further out from the center - many representations have the trigrams upside down). Also if you change all yin to yang and vice versa then the ordering is maintained it is just rotated through 180°. Heaven related trigrams are at the top, earth related trigrams at the bottom. Using this alternative number association most of the pairs of numbers on the He Tu figure appear adjacent (4,9); (1,6) and (3,8) but not (2,7). The normal arrangement of the bagua follows the Later Heaven sequence 后天 hòu tiān, here the arrangement at first look does not look as symmetric or meaningful but that is before taking into account the Luo shu magic square. There is a symmetry around the horizontal though; if a mirror is placed across the middle then their inverses appears in their place : ☴ for ☶; ☷ for ☰ and ☲ for ☵. Historical studies have shown that the 'later' heaven arrangement was invented earlier than the 'earlier' heaven arrangement – just to muddy the waters further. In the Lo Pan compass for Feng Shui you will see either or both the earlier or later Bagua figures in the rings close to the center. The Earlier Heaven sequence is used for location of graves and tombs while the Later Heaven is used for houses and gardens. In this way each element was an even and odd number (yin-yang) association. However the really surprising outcome is that these pairs are the arms of He Tu figure (1, 6); (2, 7); (3, 8) and (4, 9). They also form adjacent pairs around the Luo Shu magic square. Earth (5) is at the center of everything, it is at rest, it is the average of all the pairs of numbers around it. All other elements are a balance of yin and yang (odd and even). The order of elements is important, it is described in the ancient classic Shū jīng and is called the ‘cosmogonic order’ as it is considered the order that they came into being. Paraphrasing the rationale, water is cold and descending; fire is hot and ascending; wood can be carved into shapes; metal can be molded into shapes and finally earth brings forth vegetation as food. The final very neat step considers the cycles of elements. The most important and best known are the creation and destruction cycles. The creation cycle is: earth gives metal (ore); metal gives water comes from (collects dew); water nourishes wood (vegetative growth); wood gives fire and fire generates earth (ash). So the creation cycle is earth - metal - water - wood - fire - earth. Bearing in mind the numerical assignments for elements look at how this maps on to the He Tu figure. The creation cycle starts at the center (earth) and moves around clockwise. Moreover the compass direction associations are interesting too: fire - south; water - north; metal - west; wood - east and earth - center. These tie in perfectly with the He Tu figure when you remember that south was always at the top of old Chinese maps. So the Luo Shu gives the seasons in clockwise order - another pleasing association. Chinese philosophers found more and more associations for elements and numbers. As the basis of the Luo Shu and He Tu are mathematical in nature the theory is hard to argue against as it is grounded in the immutable properties of numbers. It took a long time to convince Chinese scholars to ditch their belief in a system that seemed to unify all key concepts. It’s interesting that one of the most popular number puzzles ‘Sudoku’ is also all about putting the numbers 1-9 in squares! Feng shui places great importance on compass direction, and to achieve greater accuracy 24 rather than 4 compass points are used. 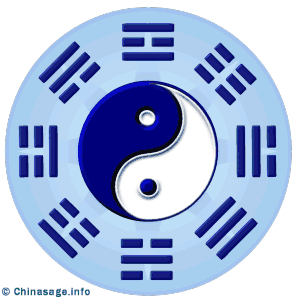 There are eight main divisions (bagua) with each trigram divided into three mountain zones. They are the 12 earthly branches; 8 of the 10 heavenly stems and 4 of the 8 trigrams (representing their positions on the taiji figure). The twenty four directions form the most important ring of symbols on a 罗盘 luó pǎn (lopan) compass which divides the circle into equal 15° segments. Citation information for this page : Chinasage, 'Feng Shui and Magic Squares', last updated 23 Apr 2018, Web, http://www.chinasage.info/fengshui.htm.